As a school we are always looking at ways to improve and as part of this we wish to review our current school uniform. In order to make a full and informed decision as a school community we will be consulting extensively with parents, students, and staff. 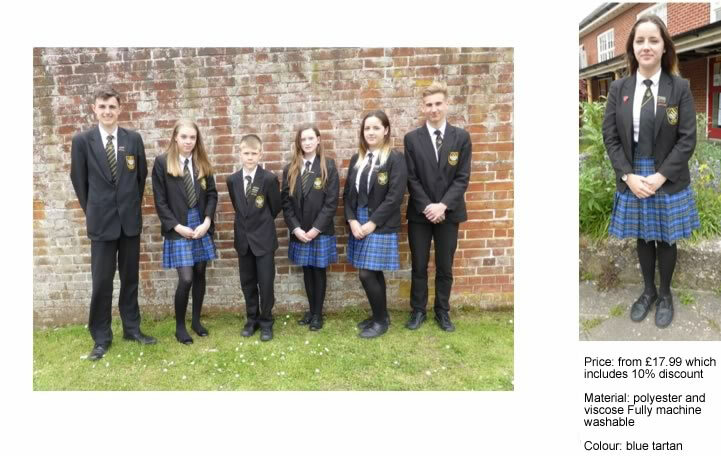 The proposed change is being introduced to improve the current standard of uniform being worn by students in the school, and to ensure that we have a cost effective, smart uniform that is followed consistently by all of our student body. There are currently too many of our students taking too wide an interpretation of what constitutes an acceptable black skirt and we are keen to eliminate any potential ambiguity on this, especially relating to students wearing either tight fitting, tube or skater style skirts. “I think the changes are a positive step forward…… my teachers can now spend more time teaching rather than wasting lots of valuable learning time dealing with uniform issues”. “This change will make things really clear and there will not be any confusion around what is and isn’t an acceptable skirt”. “This skirt will create greater equality at the school with all the skirts being the same”. The proposal is that from September 2018 students wishing to wear a skirt from years 7-10 (however the new skirt will also be optional for students in year 11) would be required to wear the Axe Valley Academy blue and gold skirt (photograph below). This skirt is supplied exclusively by Thomas Moore and retails from £17.99. We have carefully considered the financial implications to parents in this proposal and the previous recommended black skirt retailed from £16.99, minimising any increase in financial commitment. Axe Valley Academy proposed uniform code for 2018. Any comments regarding the proposed change to the uniform should be sent via uniform@axevalley.devon.sch.uk for consideration by Friday 1st June 2018. We are seeking student views through tutor groups and the Student Council. We would like to thank you in advance for taking the time to express your views. Information will be shared via Parentmail and the school website by 12th June 2018. We would recommend that you defer any decisions regarding the purchase of school skirts until after the decision has been made. Start of student consultation via individual questionnaires . Decision made on proposed changes. Staff, students and parents informed via school website and a letter sent home. Assemblies – Uniform expectations for September 2018. Thomas Moore (uniform supplier) to visit the school on numerous occasions to show and sell all aspects of the uniform (dates to be confirmed via school website and parentmail letter). Proposed start date for uniform changes to begin. Consultation on changes to the Axe Valley Academy skirt. During the consultation period we received 9 emails from parents raising questions or concerns in response to the consultation representing 1% of parents. We have responded to the concerns and questions below for reference as well as a direct response from Mr Scott to each email received. It is not acceptable to expect current Y10 students to buy the skirt for 1 year only. As detailed in the initial consultation letters the skirts will be optional for Year 11 students in September 2018. The skirt doesn’t match the rest of the uniform. The main concern raised was that the striped tie clashed with the blue and gold skirt. Next year we will be consulting on the school tie, where we will look at a variety of colours and ties. A wide variety of school skirt styles, materials and colours were investigated prior to the consultation and the skirt proposed was the best value for a patterned school skirt. A plain black skirt alternative with a school logo was too expensive to be a reasonable consideration. In the consultation letter the skirts the girls are modelling are unflattering and ill fitting. As the skirts are currently a proposal only a few sample sizes were available for the students to model. There will be a wider range of sizes which Thomas Moore will fit free of charge if the proposal is successful. The skirts proposed are normally worn in private schools and we are pretending to be something we aren’t. At Axe Valley Academy we are proud of our student body and celebrate students wearing their uniform with pride to represent their school. Many comprehensive schools in the region have also chosen to move towards a bespoke skirt to reinforce their school identity. The price has been considered carefully and is a minimal increase on the price of the previously recommended black skirts from Thomas Moore. Uniform shouldn’t be the focus as there is no correlation between exam results and uniform. Axe Valley Academy has the core values of excellence, perseverance, respect and care that should extend to all aspects of school life. Students who are invested in their school community achieve better. Uniforms create a shared sense of identity and pride in our school and importantly they take away the stress of deciding what to wear and the risk of bullying due to your clothing. Uniforms are also shown to promote a sense of purpose and schools with a strict uniform code often achieve better exam results as a consequence of high expectations. There have been too many changes to uniform over the last 4 years at AVA. There have been some changes to the uniform as Axe Valley Community College became Axe Valley Academy, however any new logo uniform has been phased in with no insistence to change for example the blazers to the new logo. There was an addition of moulded footwear for the AGP when this was introduced as a brand new facility to improve the school. The bespoke PE kit was introduced as a phased introduction again to promote a culture of pride and success. All of the changes to the uniform have been introduced as a result of new facilities and in order to raise the aspirations of AVA students. With only 1 skirt available for the students we are trying to remove all individuality and expression from our young people. Uniforms are designed to promote a sense of identity and pride in our school and ensure equality. If I refuse to buy the skirt can we assume that you will not reprimand my daughter but me as the parent? The school uniform policy will be enforced for all students at AVA. If a parent chooses to disregard the policy their child will receive the sanctions outlined clearly in the behaviour policy. Why have you sent out a uniform list and documentation listing the uniform Thomas Moore carry, both of which have the proposed skirt listed as a uniform requirement and not the current uniform? Thomas Moore produced a new proposal list for parents to be able to consider all of the uniform requirements together for reference. They currently display the black school skirt options on their website. Will new skirts be bought for all existing students by the school? Can you confirm that the new skirt will be compulsory from September, and will not be phased in as new skirts are required? We can confirm that for Y7-10 the blue and gold new skirt would be required for all that choose to wear a skirt. No black skirts would be permitted in Years 7-10 from September 2018. For Year 11 a black school skirt that complies with the policy would be permitted for one year only 2018-2019. Why can’t the current uniform policy be enforced? Due to the wide variety of black skirts available from fashion outlets which do not comply with the policy, the variation makes enforcing a non-school shop black skirt impossible for any school. The introduction of a bespoke skirt removes any ambiguity for parents, students and staff. Can you clarify the cost of the skirt as different prices have been communicated? The skirt normally retails from £19.99 as shown on the Thomas Moore price list and letter. We have advertised the 10% discount price Thomas Moore are offering for new skirt purchases which means the skirts can be bought from a discount price of £17.99. Thomas Moore will be available in school for discounted skirt purchases on a series of dates we will confirm to parents after the final closure of the consultation. We would like to thank all parents who responded to the consultation letter. Several emails also supported the need for a change to the school skirt and welcomed the removal of the current range of black skirts. We are currently processing all of the information from the student survey to contribute to the final decision about the proposed new school skirt which will be communicated via Parentmail and the school website by 12th June 2018.